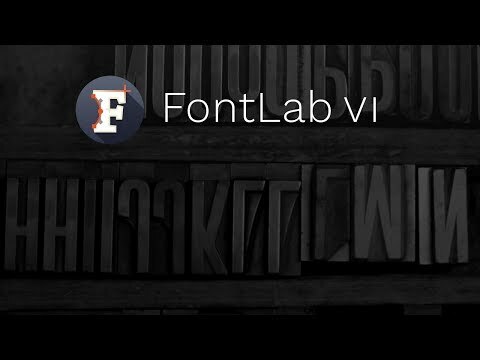 FontLab VI is here! Unleash your type design creativity with FontLab VI, our ultra bold font editor. 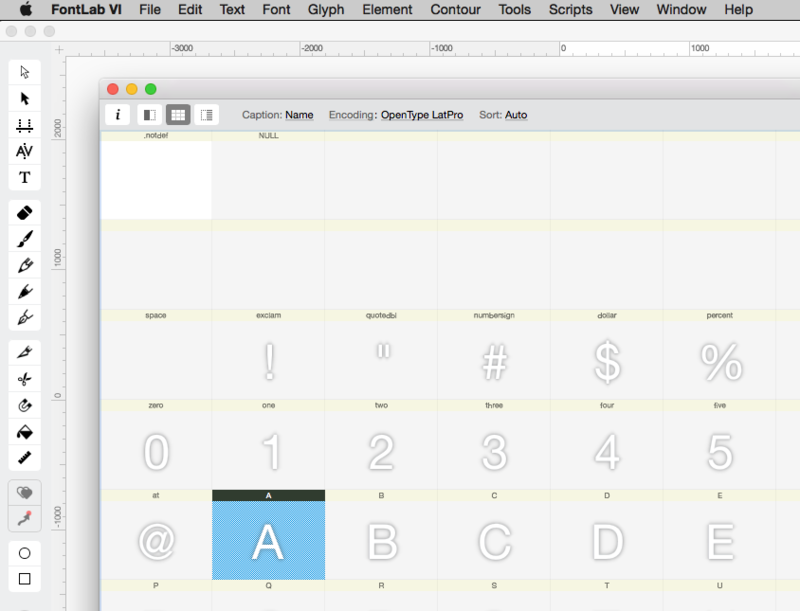 Design and edit glyphs more easily than ever, draw multi-color fonts, or make variable fonts. Type drawing, spacing, kerning, hinting, OpenType features and Python scripting — FontLab VI does it all, on both Mac and Windows. FontLab VI is $689 (it includes both Mac and Windows versions). If you bought FontLab Studio 5 between Nov 30, 2015 and Dec 6, 2017, the upgrade to VI is free, all other users of FontLab Studio 5 can upgrade for only $199, and Fontographer 4.7 & 5 users for $344. 1 - will the release version, like the beta, safely run alongside FontLab Studio 5? Hello André. Answers: yes and yes. Here you get more info about user custom files. Super thanks! Can you tell me how to have a font window and tools / panels in the same window? I find it very uncomfortable that now tools and panels are below them. There is an option in Preferences > General > Windows and tabs configuration. You can select to have everything docked in a single window (first icon), to have glyphs tabbed in a single window and fonts in separate windows (second) and to have everything floating (third). Note that you can freely position and dock panels by dragging their titles. Icons at left are X (close) and V (retract). At right the icon alternates between the three dock options: dock at any place, dock with others and no dock. The interface organization could be saved as a workspace in Window > Workspaces. Pretty much the same you have in InDesign, among other applications. Attached is a sample workspace that can be imported to FontLab VI. 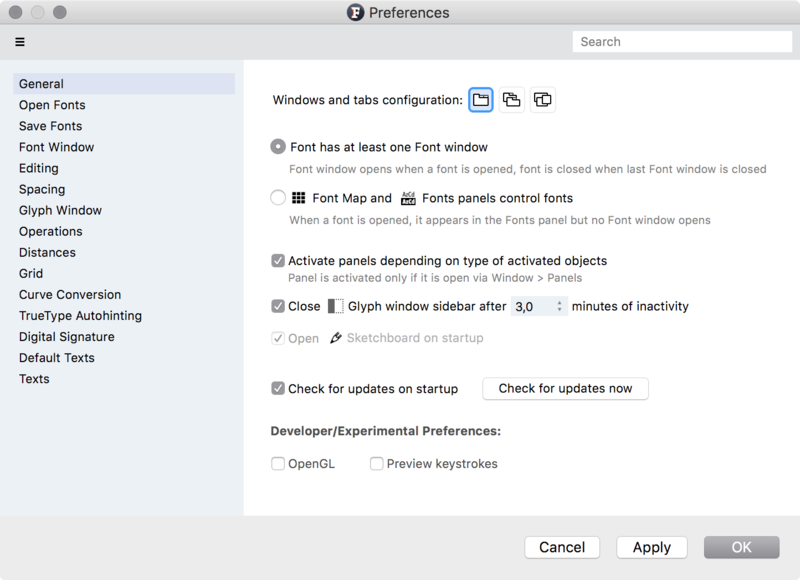 Use setting 3 of http://help.fontlab.com/fontlab-vi/Preferences/#windows-and-tabs-configuration if you prefer to work with floating windows instead of tabs. Note that you can undock the toolbar and the panels from "inside" the main window and stick them to the edge of the screen. And if you want tabs, you can use setting 1 and then if you undock a tab (turn it into a floating window), you can dock it back — it takes a bit of practice though. You grab the window title and move it near the tab titles until you see a blue highlight. Damn, Igor, you beat me to it! Thanks! Now I like it more Sketchboard is vey useful for making complex lettering works, using glyphs slots for such things in FL5 makes the drawing interface to become unstable. "Keyboard shortcuts are not yet customizable in FontLab VI." 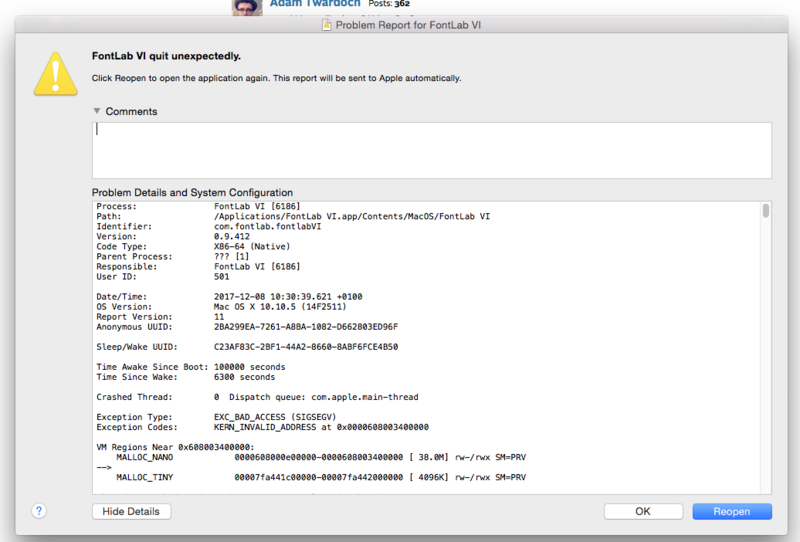 If I create a bunch of new fonts via CMD+n and the close the program, instead of asking for saving, it crashes. Full error message text sent by email. Yes, that was exactly our thinking Sketchboard is good for creative prototyping. But you can also do File > Export > Window Contents and you get a nicely rendered PDF of the Sketchboard artwork (you can also do this from any glyph or metrics window). And if you export as SVG instead, you get the WYSIWYG vector rendering of the window, with nodes, guidelines etc. Yes, I could reproduce it. Added as a bug to be solved. Thanks for reporting it. There will be blood. And updates. 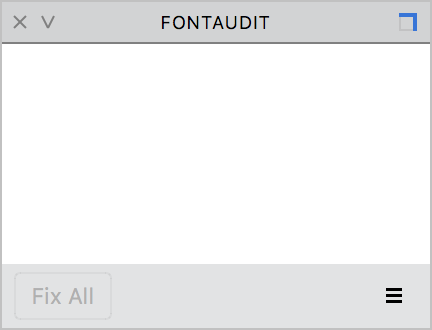 "FontLab VI, our ultra bold font editor"
But what if I want to design other weights? Congratulations to everyone at FontLab on this important and exciting milestone! We only do ultra bold. I mean, one app can't do everything, right? Sheesh, I was so tired last night when I posted the stuff that I got the wrong attachment. sigh. I'll see if that can be fixed. That’s really exciting, Thomas! Congrats! Hmm, so tons of bugs and missing features posts daily on the Fontlab 6 forum, and it jumps straight from alpha to retail release? I'm hoping you aren't going on vacation to celebrate the release, but instead are working non-stop to fix and add necessary Fontlab 5 features to this program people are now purchasing. Yes, lots of bugs have been reported, and lots of bugs that get fixed. Just to give you some idea, in the past month we have averaged 30+ bug fixes per week. So if you think you see a fair number of bugs reported in the forum, well, sure. But there have been a ton of things fixed as well. Not saying the app is perfect, just that using the number of bug reports prior to ship as a measure of how buggy the app is *now* may be misleading, in the absence of other data. Also: we’ve been on an agile development path for FontLab VI for a long time now. We didn’t publish the Preview builds too often because there were periods when we’ve done some rewrites and refactoring. But mostly, it’s been bug fixing, which no doubt will continue, and we’ll be providing users with relatively frequent updates. Fortunately, with automatic update notifications, this is relatively easy — though people do notice it because we only have update notifications, not completely automatic updates. These days, on iOS, new versions of some apps are released every week, and even on desktop platforms, web browsers get quite frequent silent updates that you hardly ever notice. We’re working towards improving our system, so that people won’t be bothered with update notifications, while at the same time have access to the most recent code, and if they report a problem, they will get the corrected version within one or two days. This is not to say we’ll get there overnight. Some might say “a promise to always deliver a new release that fixes any problem overnight or within two days” is unrealistic. Even the actual compilation and building takes time — you’d be surprised. New builds need to be tested etc. So the reality will be sometimes slightly less spectacular, but a frequent release schedule and swift responsiveness is an important goal to keep in mind, and an actual principle we’re using in our work. It’s evolution of software: we’ve been using a new issue tracker for the last few years that is swift and comfortable, much better than what was available even a few years ago, and also the infrastructure which we can use when we can work together as a company, building, testing and releasing new versions, has been made much better. But it’s also an evolution of mental experience: quite a few of us have been working on FontLab tools for a long time now, so we had a chance to speak to many type designers, watch them work, learn about their priorities. This experience has taught us some humility and moderation between what we think is best and what the users tell us they’d like to see. We’ve worked on FontLab VI for over five years, which I guess means that we’re dedicated. I’m confident that the combination of these two factors will allow us to get nearer that goal of mine. You mean for various menus? We will need to find an icon designer who will take on the task of visualizing all the different operations you can do in FontLab VI. That would be great, actually!